BMW will pay a $10 million fine and another $10 million worth of compliance procedures for failing to correct a MINI crash deficiency, the NHTSA announced Monday. The company, which said it addressed the issue but allegedly didn’t, will owe another $20 million if it doesn’t comply with this consent order, according to the National Highway Traffic Safety Administration. NHTSA said it fined BMW $3 million in 2012 for a similar violation. In 2014, NTHSA noticed that side-impact moving deformable barrier tests at 5 mph above the federal standard could be harmful to the spine of a child riding in the back of a 2014 MINI two-door hardtop Cooper. 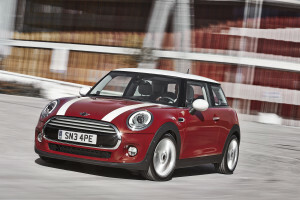 BMW said that the MINI Cooper should have been tested at the same weight of a Cooper S, and recalled certain 2014 Coopers to add a “small foam patch” in the rear door panels and 2014-15 Coopers to state a higher weight, according to the NHTSA. In January, BMW said it would add more padding to the rear side panels of the 2015 MINI Coopers, but didn’t, according to the NTHSA. BMW did have one car equipped with that padding, and it passed the side-impact crash in question in July. But another car lacking with the padding failed, even though it was tested in the Cooper S weight class. “NHTSA is concerned that BMW was aware or should have been aware of the non-compliance with FMVSS 214 and should have taken remedial action on the population of Mini Cooper vehicles identified in recall 15V-450 earlier than it did,” its investigation states. “It appears from a review of NHTSA’s databases that BMW may have failed to submit recall communications to NHTSA in a timely manner. Under the NHTSA Consent Order, BMW admits it failed to recall the MINI Coopers within five days of learning the 2014 and 2015 models weren’t up to snuff for side-impact crash protection. “It also acknowledges additional violations discovered in NHTSA’s investigation, including failing in multiple recalls since its 2012 consent order to notify owners and dealers of recalls in a timely fashion and to provide required quarterly recall completion reports on time,” according to the NHTSA. BMW must hire an independent safety consultant to determine how best to comply with federal law and, intriguingly, try a pilot program to see if data analytics can find defect trends. The OEM also must figure out how to keep dealerships from selling recalled cars. NHTSA was able to buy a recalled new vehicle from a BMW dealership while investigating the automaker. It also shows the difference a seemingly minor change — a little extra padding and an extra 5 mph — can have on how well an occupant fares, a good argument for following OEM procedures to the letter on your end. Finally, while in this case BMW was dinged by the feds, what if an OEM does everything right and built a vehicle up to regulator (or IIHS) scrutiny? Would your repair preserve that performance?